Target Savers!! 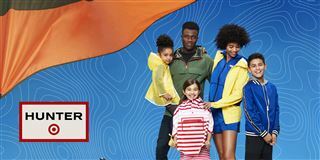 Target has just announced they will be launching a new fashion line for the whole family with Hunter on April 14th! This line will be available both in-stores and online and will consist of more than 300 items ranging in price from $5.00 to $45.00. The line will include rain boots, children’s clothing, accessories, and more! I am super excited for the rain boots, as they are normally priced at $150.00 and up, so to get them at under $45 is a steal! They are sure to be the best-selling item! This collaboration will also include home decor items, camping supplies, such as hammocks and coolers, with prices ranging from $6.00 to $80.00 with most items under $30, and will be offering in sizes for everyone. Target REDcard holders will get early pre-order access to a few exclusive items starting on April 7th, a week before everyone else! If you don’t have a REDcard, now would be the time to sign up and take advantage of early access items, plus you save 5% on everyday purchase and get FREE Shipping! This is sure to be an exciting launch, with items selling out FAST. Read more here.